Excitement crackled in the frosty air as four young hunters loaded guns and gear into the pickups. The temperature had dropped from a comfortable 60-plus degrees down to a bone-chilling 25 degrees, but nobody seemed to notice or care. The Black Wolf Hunting Club was on the prowl at Proctor Lake, northeast of Brownwood. “I’ve always wanted to learn how to hunt and go out with my grandpa,” Sean Lopez of Corpus Christi told me. At 12, Sean was the youngest in the group. He and Gregory Larks, 14, of Austin were on their first hunt. The others — Deion Teague, 14, and Jaylan Ridge, 15, of Waco — had harvested their first deer a few months earlier on another hunt. Black Wolf members were serving as mentors on this trip, passing along a tradition of being “country” — self-reliant, able to provide for ourselves and our families from what nature provides. Less than an hour after sunrise, the reports started coming in. Three deer had already been harvested — the first-time hunters had brought beginner’s luck. Moments like these were exactly what I had in mind when I founded Black Wolf Hunting Club, dedicated to promoting hunting and hunting-related sports to the minority community. 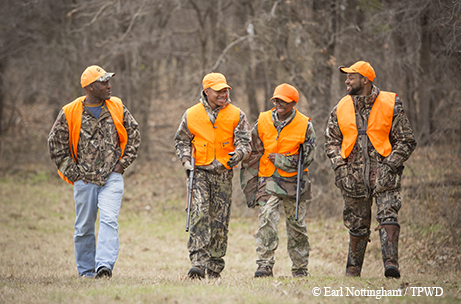 Eric Morris, Jaylan Ridge, Deion Teague and Solomon Murray share good times on the hunt. Where did the name Black Wolf come from? Wolves are skilled hunters, renowned for being among nature’s top predators. While most wolves share a common color, a black wolf is a rarity among its hunting brothers. According to a recent study, African-Americans make up less than 2 percent of hunters in America. 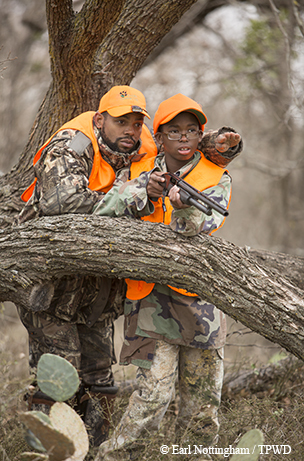 From 2012–13, only 648 black people received their Texas hunter education certifications (of 47,500 total). There are some misconceptions out there. Some people are surprised to learn that I am a big-game hunter; they assume I’m just a raccoon-and-rabbit guy. I realized that I needed to do something to change the prevailing attitudes and the status quo. After all, children who are involved in hunting are less likely to be involved in incidents involving firearms. From what I’ve experienced, minorities really do have an interest in hunting and the outdoors. Many want to learn how to hunt, shoot a bow, select the right hunting firearm or camp, but because they don’t see people like themselves in the media images of hunters, most are left with the false assumption that hunting is something that minorities just don’t do. At Black Wolf Hunting Club, we host group hunting and fishing trips throughout the year as well as events to promote hunting and the outdoors to all. We are actively involved in marksmanship, tracking, archery, skinning and processing of fish and game, as well as fishing, boating and hunter education. We are ethical hunters and outdoorsmen who work for the conservation of wildlife habitat. Since 95 percent of Texas land is privately owned, it can be difficult to find opportunities to conduct hunts like these. Months of preparation, planning and coordination with the Texas Parks and Wildlife Department and the Proctor Lake Corps of Engineers went into making this hunt possible. 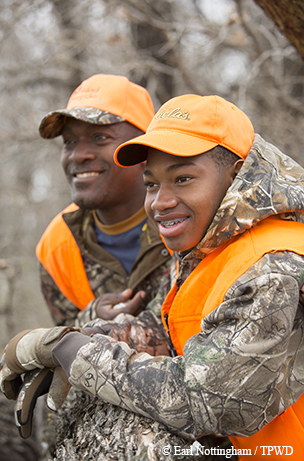 Deion Teague learns hunting basics from mentor Solomon Murray. Although most of the hunters had set their sights on the excellent populations of deer at the Promontory and Copperas Creek areas of Proctor Lake, Jaylan wanted a hog. He reminds me of myself at that age. Like me, he is obsessed with hunting and all things outdoors. Like me, he makes all sorts of traps and hunting apparatuses in preparation for his next day afield. And like me, his parents still wonder where in the world he came from, as Jaylan constantly surprises them. Just as some people are born with the natural ability to play instruments, draw or sing, some of us are born to be hunters. An hour passed before Jaylan caught the movement of a dozen or more hogs through the woods. They were on us so fast that the young hunter didn’t have time to raise his gun. With hogs standing five yards away from the blind, the only option was to let them pass and try to take a shot once they were a little farther away. It is amazing how fast a hog’s little legs can move that barrel-shaped body. The hogs ran by the blind, right past the feeder and out of range. Ninety minutes later, just as the last shooting light approached, the silence of the woods was broken by the sound of snorts, squeals and twigs breaking. As the hogs swarmed nearby, an old gray-faced sow turned broadside, and Jaylan took his shot. A second shot put the hog down for good, and, at last, Jaylan had his hog. Group founder Eric Morris hunts with Jaylan Ridge. Successfully harvesting an animal is the easiest part of a hunt. The real work begins once you drag the animal out of the woods. With four deer and one hog hanging on the skinning tree, there was plenty of opportunity to show the kids how to properly dress and quarter the animals. Sean also got two does, so he’s more than ready to hit the woods with his grandpa or any other hunter. Deion didn’t shoot anything on this hunt, but he was a good sport and will bring home the memory of seeing a hog so large that I had to look twice to make sure it wasn’t a black bear. Looking back, this was a textbook hunt for the Black Wolf Hunting Club — new hunters, supporting parents, experienced mentors and zero accidents. What more could you ask for? The kids were already talking about hunting again next season, but we’ll be taking another group then so we can introduce as many youth to hunting as possible. Sometimes, the messenger matters, so it’s powerful when minority hunters speak to a minority audience about hunting and the outdoors. Black Wolf welcomes more outdoorsmen to shoulder a greater responsibility in recruiting and mentoring the next generation of minority outdoorsmen. We all share a rich hunting heritage and enjoy the beauty of nature, and we know that hunting builds independence and self-reliance, traits so necessary in today’s world.